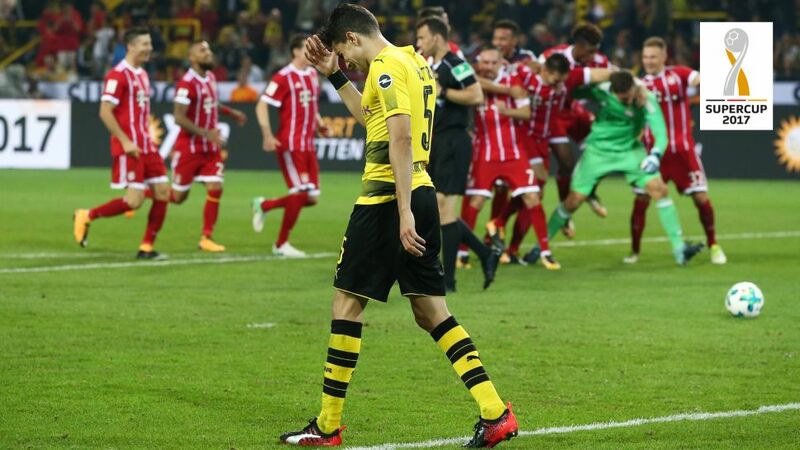 There were mixed emotions in both camps after defending Bundesliga champions Bayern Munich landed the first meaningful blow of the season on 2017 DFB Cup winners Borussia Dortmund to lift the on Saturday. Robert Lewandowski (Bayern striker): "I'm very happy to win, it's the first title of the season. We made a few mistakes, but it's the first match of the season. We have to improve. I'm sure we'll be running like clockwork in a few months. We'll definitely be as strong as in the last one or two seasons." Thomas Müller (Bayern forward): "It was a close game. There's always a bit of luck involved when it goes to penalties and you need a good goalkeeper, but our will to win was plain to see. There was an outpouring of emotion when we wrapped up the win. It was a lot of fun. The Supercup win is doubly important after our defeats in pre-season." Niklas Süle (Bayern defender): "It's not been easy for us in recent weeks. A number of players were away on international duty and reported back later than the rest. The lads travelled to Asia, which takes its toll. For me, though, it was a special game, playing against this backdrop. Obviously there's a bit of luck involved whenever it comes to penalties, but I'm delighted we were able to turn the game around." Carlo Ancelotti (Bayern head coach): "Dortmund played well. It was an open and difficult game, as we expected. We know penalty shootouts are a lottery, but it's an important win. It's the first title of the season. Our pre-season preparations haven't been great, but that is nothing to worry about. When the season starts, we'll be ready. I'm happy." Watch: More from Carlo Ancelotti on "an important title win"
Sven Ulreich (Bayern goalkeeper): "Today we saw some of the FC Bayern we want to see. We created a hatful of first-half chances we should have made more of. We conceded two sloppy goals, but we still managed to win. We showed the right attitude and have to keep it up. Obviously I'm happy I could help the team in the shootout and win the title." Sokratis Papastathopoulos (Dortmund defender): "The first 15 minutes were good, as was the second half. Bayern were better between times. It would have been great to win, but there's always an element of luck involved in penalties. We've won the Supercup twice in recent seasons, but then finished each campaign with nothing. Last season we lost the Supercup, and then went on to win the DFB Cup. We know we're still not fully implementing what the coach wants from us. That's normal. These things don't happen overnight, but we're improving all the time. The next two weeks before the start of the Bundesliga season are very important." Nuri Sahin (Dortmund midfielder): "We started very well, but then lost our way. Bayern put us under a lot of pressure. We have a new coach, and we still need to learn his philosophy, but we implemented his strategy well after the break. We dominated the second half, which is why the defeat is so tough to take." Peter Bosz (Dortmund head coach): "We started well, but were lucky it was only 1-1 at the break. The second half was better, but you can't be satisfied if you come away with nothing after leading 2-1 with two minutes to play. We led three times, including the shootout, that's why we're disappointed. We need to improve, but we will!" Sebastian Rode (Dortmund midfielder): "I played well in the second half, but it's obviously very frustrating that I then missed my penalty. We haven't always been convincing during pre-season, so in that sense it's a step in the right direction. There's room for improvement in terms of our pressing game, but I think we did a much better job today." Roman Bürki (Dortmund goalkeeper): "We shouldn't have allowed the game to go to penalties. We were the only team that played football in the second half. Bayern got lucky with their second equaliser. It all happened so quickly, but, like I said, we should never have let the game go to penalties." Follow this link to relive the Supercup 2017 as it happened!